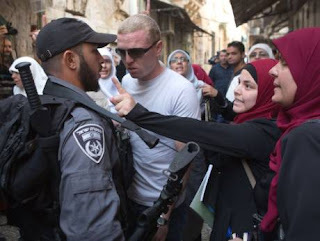 Palestinian women from the so-called Murabitat group argue with Israeli policemen during a protest against Jewish groups visiting the Al-Aqsa mosques compound and against preventing them from entering the shrine in Jerusalem's Old City on September 16, 2015. Ramallah: Al Haram Al Sharif was relatively calm Wednesday after three days of clashes between Palestinians and Israeli occupation forces and Jewish colonists. Occupation soldiers have attacked Palestinian demonstrators over the last three days throughout the Jewish new year holiday of Rosh Hashanah in an effort to allow Jews access to the Muslim holy site to pray and perform their rituals. Twenty religious Jewish visitors toured the site in small groups early Wednesday, accompanied by Muslim authorities who administer the compound and Israeli officers. A group of Muslim women sitting near the mosque chanted religious slogans in protest as some of the Jewish groups passed by. The site is revered by both Muslims and Jews and is a frequent flashpoint for tensions. Jews are permitted to visit the hilltop compound but banned from praying there. Muslim officials at the site said 130 Jewish visitors toured there Sunday, the eve of the Jewish new year. It was a large number compared to the scant dozen who usually visit daily, and it triggered the demonstrations by Muslims, the officials said. Muslims see Jewish visits to the site as encroachment on their holy site. On Wednesday, two Palestinian guards of Al Haram Al Sharif were brutally attacked by Israeli occupation soldiers who were escorting at least 10 Jewish colonists to Al Haram Al Sharif. According to eyewitnesses who spoke to Gulf News, the guards were attacked for no apparent reason. “The commander of the Israeli forces ordered his men to stop attacking the guards, but the occupation soldiers told him to shut up,” Samer Al Rifai, head of the civilian guards at Al Haram Al Sharif said. London: British air strikes in Iraq have killed around 330 Daesh terrorists since they began in September 2014, Defence Secretary Michael Fallon said in a statement on Thursday. “The estimated number of Daesh terrorists killed as a result of UK strikes from September 2014 to 31 August 2015 is around 330,” the minister said, in response to a question from Green Party MP Caroline Lucas. “We do not believe there have been any civilian casualties as a result of UK strike activity,” he added in the reply, which was published on parliament’s official website. Britain currently has eight Tornado GR4 fighters and several Reaper drones conducting strikes, as well as a Sentinel and an Airseeker - both surveillance craft. Fallon confirmed in August that Britain had carried out more than 250 air strikes in Iraq. 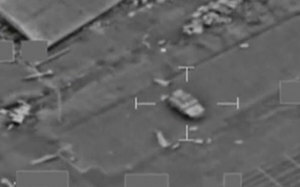 Britain announced last month it was extending its air strikes against Daesh targets in Iraq by a year to March 2017. The announcement represents a second reprieve for the squadron of ageing Tornado GR4 fighter bombers currently based in Cyprus which was due to be disbanded first this year and then next, and will now be kept on. “We want to ensure we maintain this crucial operational tempo and so we will extend the lifetime of Number 12 Squadron for a further year to March 2017,” Fallon told the BBC during a visit to Baghdad last year. The Tornado jets are carrying out air strikes, reconnaissance and surveillance over Iraq as part of US-led operations. Britain is not currently taking part in air strikes on targets in Syria, although it was announced last week that an Royal Air Force (RAF) drone over the country had killed a British terrorist planning attacks on Britain. 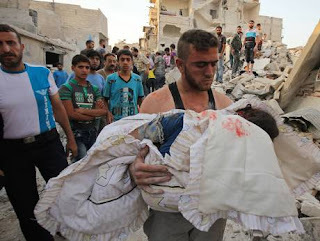 In 2013, Prime Minister David Cameron’s plan to join international military action in Syria was defeated by the House of Commons due to opposition from the Labour party. Prime Minister David Cameron is now mulling a second vote to gain support for Syria strikes this year. He hopes the new Labour chief could give him the support needed to get the move through the House of Commons, where he has a majority of only 12. Parliament approved the Iraq air strikes last September. Baghdad: Two suicide attackers targeted Iraqi police checkpoints in commercial areas in central Baghdad during rush hour Thursday, killing at least 14 people, officials said. Both attacks were carried out by bombers on foot, wearing explosives-laden vests, two police officers said. 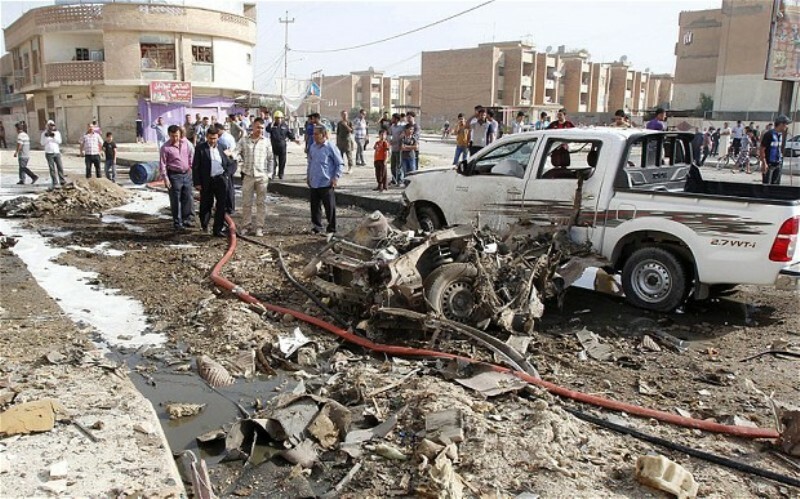 One bomber struck in Baghdad’s Bab Al Sharji area, killing eight civilians and a police officer there. Twenty-one were wounded in that explosion. The second bomber hit in Al Wathba Square, killing five people, including two policemen, and wounding 12. Two medical officials confirmed the casualty figures. All officials spoke on condition of anonymity because they are not authorized to talk to reporters. Iraq is going through its worst crisis since the 2011 withdrawal of US troops. Daesh controls large swaths of the country’s north and west after capturing Iraq’s second-largest city of Mosul and the majority of the western Anbar province last year. 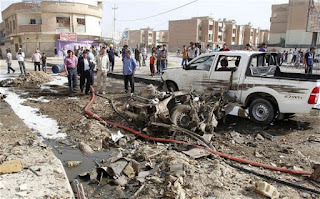 Since the emergence of Daesh, Baghdad has seen near-daily attacks, with roadside bombs, suicide blasts and assassinations targeting Iraqi forces and government officials, with significant casualties among the civilian population. The violence has killed hundreds and displaced tens of thousands of Iraqis. 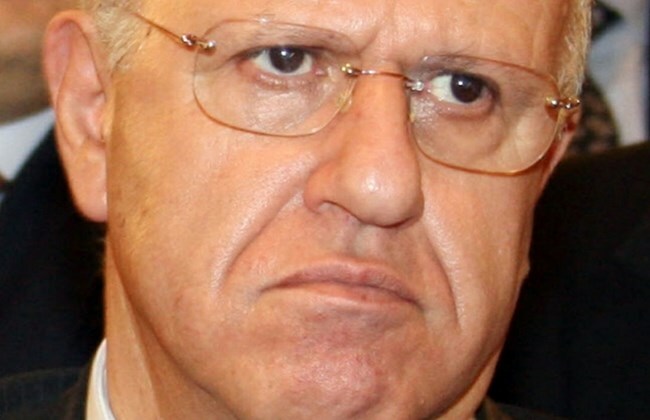 Beirut: As expected, the Military Court of Cassation postponed the retrial of former minister Michel Samaha to October 22, because his attorneys asked for more time to look into the content of recordings between Samaha and Milad Kfouri, an undercover police agent. Samaha, one of several high-profile prisoners in Lebanese custody, was arrested in August 2012 by the Internal Security Force’s Information Branch, allegedly for arranging the assassinations of leading political and religious leaders. The former cabinet minister, who boasted about his impeccable pro-Syrian credentials, confessed to various plots before he recanted. In the recordings broadcast over the airwaves and posted on YouTube, Samaha acknowledged that President Bashar Al Assad and the head of Syrian Intelligence Ali Mamlouk instructed him on what to do, facilitated the trafficking of bomb-making equipment and showered him with cash. A Syrian man carries a dead child following a government air strike on the rebel held Al-Maghair district of the northern Syrian city of Aleppo on September 16, 2015. Washington: Amid increasing unease and uncertainty over Russia’s intentions, the Obama administration plans to accept an offer from Russia for direct talks on its military buildup in Syria that US officials believe is aimed at propping up Syrian President Bashar Al Assad. Seeking answers to myriad questions about the precise reasoning behind Moscow’s recent deliveries of materiel and manpower to a base in northern Syria, US officials said they expect the administration to begin a military-to-military dialogue with Russia in the coming days. The Pentagon will take the lead in the discussions but the exact level, venue and timing have yet to be determined, officials said. Those details could be announced as early as Wednesday, according to the officials, who spoke on condition of anonymity because they were not authorized to discuss the matter publicly. Secretary of State John Kerry revealed the Russian offer for talks when he told reporters on Wednesday that Russian Foreign Minister Sergey Lavrov had proposed them in a phone call a day earlier. Kerry said he personally thought the idea was a good one, but stressed that the administration was still weighing its merits. Other officials said later that national security adviser Susan Rice had signed off on the talks and that Defense Secretary Ash Carter had agreed. Kerry said Lavrov had told him that Russia was only interested in confronting the threat posed by Daesh in Syria. But Kerry stressed that it remained unclear if that position would change and Russia would mount a defense of Al Assad, who the US believes must leave power. However, Kerry added that if Russia is only focused on Daesh, then it remains a potential partner in pushing for a political transition in Syria. “If Russia is only focused only on Daesh and if there is a capacity for cooperation ... there still is a way to get a political negotiation and outcome,” the secretary said. Kerry also said he had spoken on Wednesday with Israeli Prime Minister Benjamin Netanyahu, whose office announced earlier that he would visit Moscow next week to discuss Syria with Russian President Vladimir Putin. Russia’s military buildup in Syria has perplexed the Obama administration and left it in a quandary as to how to respond. In the afterglow of the Iran nuclear deal, which was hailed by the administration as the kind of diplomacy that can be achieved when Russia and the United States cooperate, US officials had hoped for a change in Russia’s position about Syria, potentially even enlisting its support to move Al Assad out. Moscow’s latest actions, however, have taken many by surprise and further muddied efforts to fight Daesh militants while trying to promote political transition in Syria. In recent days Russia has sent about a half-dozen battle tanks and other weaponry - along with military advisers, technicians, security guards and portable housing units - to Syria with the apparent goal of setting up an air base near the coastal town of Latakia, a stronghold of the Syrian president. US officials say Putin’s intentions in Syria, particularly in the medium- to long-term, remain a mystery.